Today until 2pm is the second day of an open house of the area Triangle DIY Biology organization near Scrap Exchange in Durham. I was button-holed to “do something” at this event and decided the easiest thing to demonstrate would be how to hand solder fine pitch SMDs. TriEmbed info sheets are on hand and we’re also plugging SplatSpace. I’m using a little space at the popup to coordinate curation of Fred Ebeling’s Collection of electronic parts at SplatSpace. As mentioned at the June 12th meeting, I find myself frequently wanting to find the sweet spot for quickly throwing a circuit together to see that gross behavior is as expected and confirm my assumptions correct and the devices perform as advertised before going to the trouble of making a PCB that is likely to be wrong if I’m in too much of a hurry. 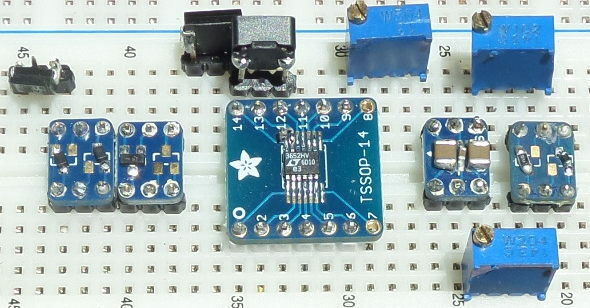 Notice the MSOP12 device is kludged onto a TSSOP14 breakout board. 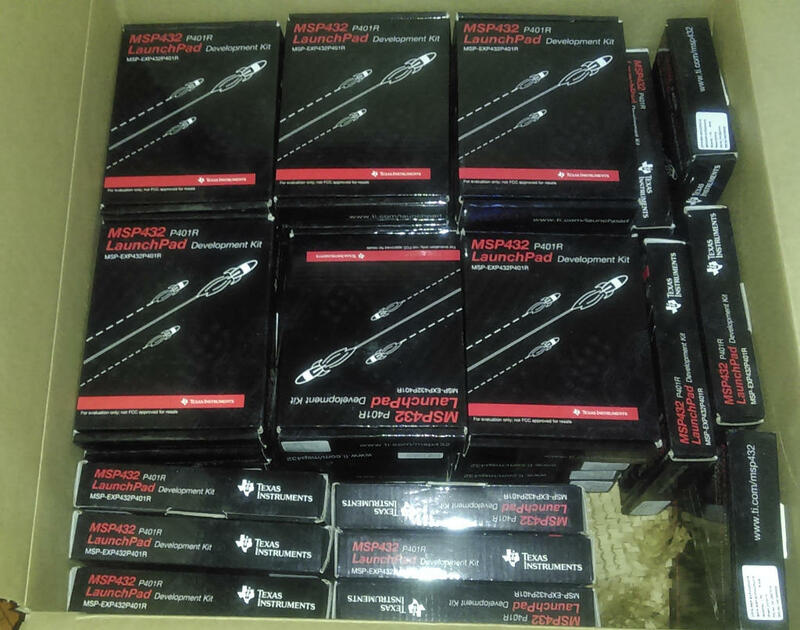 Also notice the (boost) capacitor soldered to the upper left pin of the MSOP12 package in the middle. 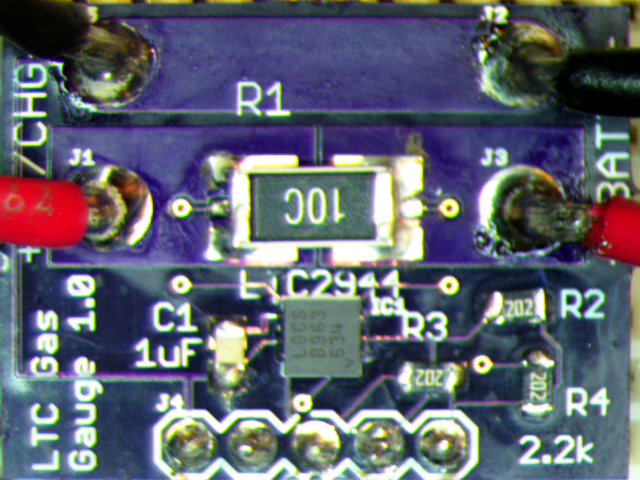 It’s the barely noticeable bump on pin 12 of the IC (coincidentally below “12”, but electrically connected to header pin “14”, thus the error-prone kludge). So, although my current breakout collection handles more than 30 devices directly, there are many gaps. This current project will bring the “package coverage” up around the 50 mark, but I estimate I’m only about half done before my hankering for this kind of support mostly dies down. For instance, there would be a lot to gain from handling the common form factors of small switches and connectors, small aluminum electrolytic caps, inductors, transistors, etc. Heck, there’s even real value in making an adaptor that saves me severely abusing a breadboard by cramming TO220 devices into the holes! Adafruit and SparkFun and others provide some excellent breakout boards at affordable prices (in contrast to Schmartboard’s stuff, which seem to be both too much and too little for my needs). Notice all five of the boards above are Adafruit ones. I have several TI breakout types as well as others. But the actual coverage of package types for the available boards out there is too sparse. 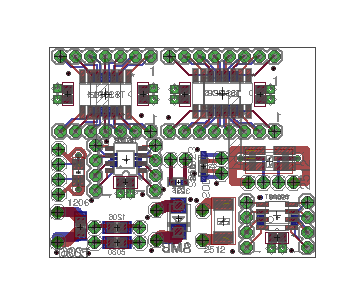 The aggregate PCB rendering above shows the approach I’m taking to build out my collection. 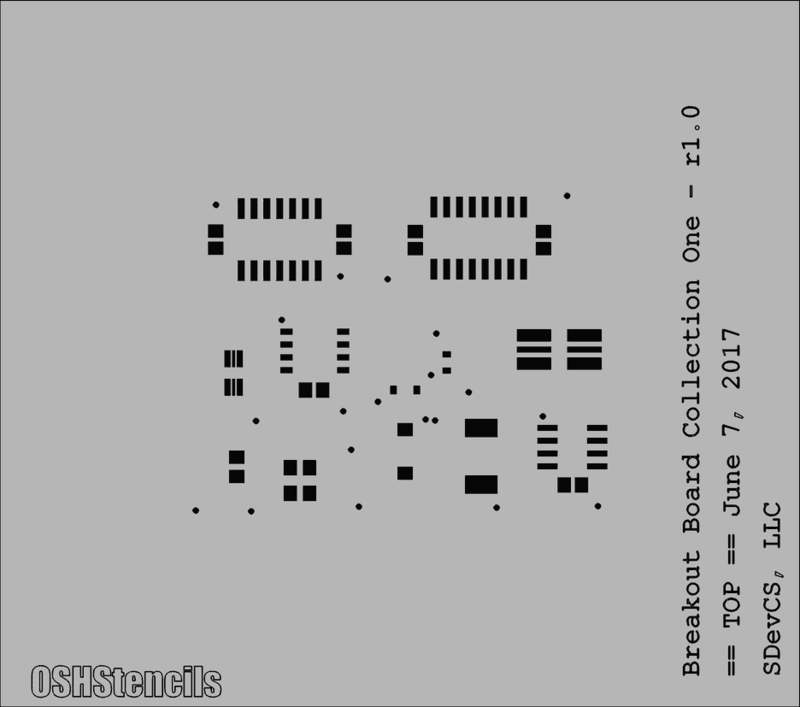 This is a collection of 12 PCBs supporting 21 package types that I pulled together for the purpose of making stainless steel stencils. 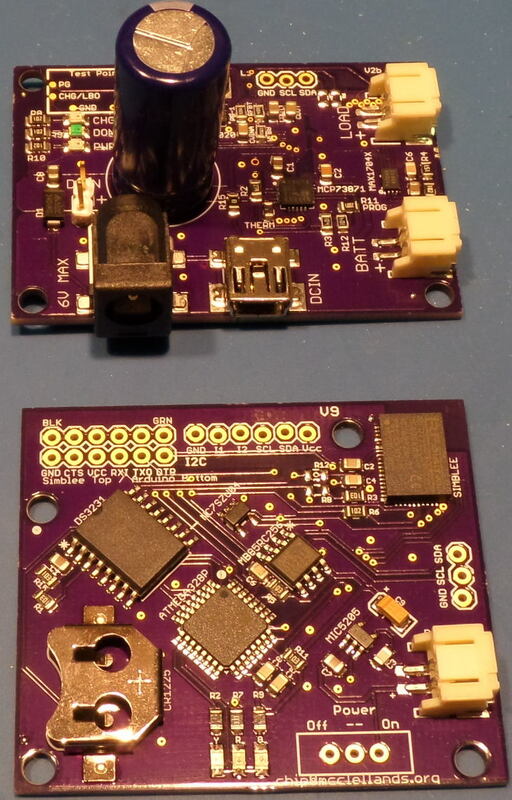 Some of the boards for larger parts have nearby pads for a few passives to make it less painful to handle bypass caps, boost caps, etc, where short connection paths are important. 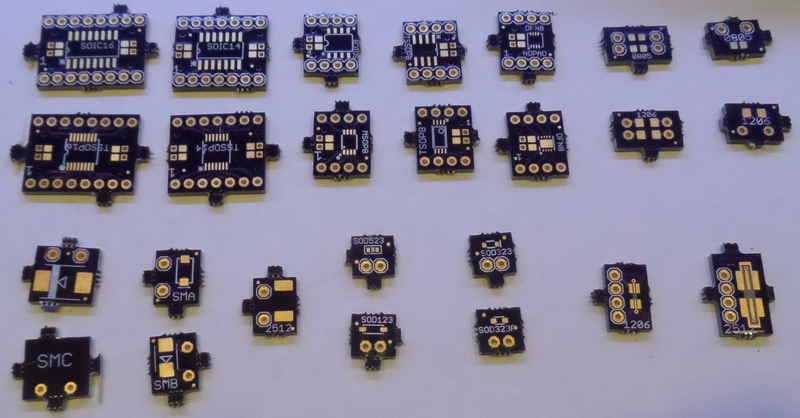 The 12 separate designs (and two others) were sent off to OSH Park to get three copies of each design as a small PCB so I can prove out the breakout boards . In theory, the work flow is to put the stencil over a particular breakout (e.g. 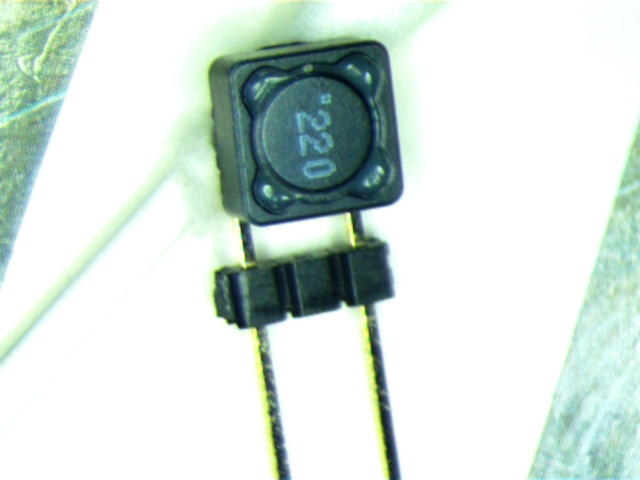 the one for the SOIC14 package in the upper left corner of the top stencil). 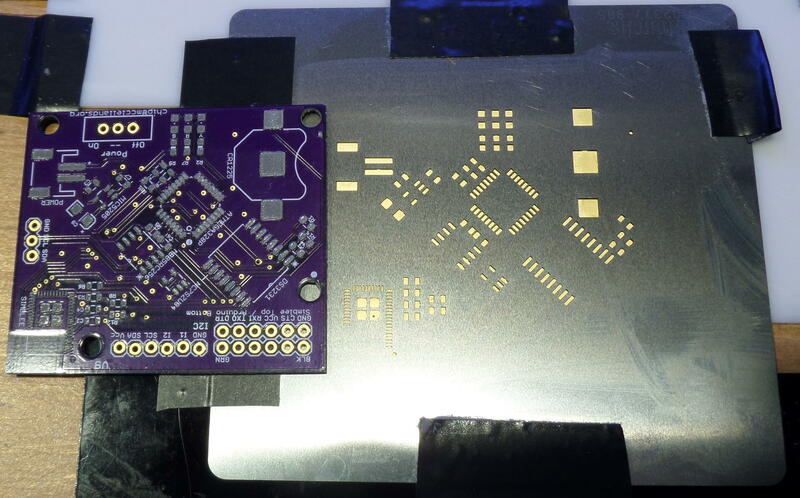 The one breakout PCB for the package is captured by a holder made of two acrylic “L” pieces vinyl-taped to a dead flat surface. 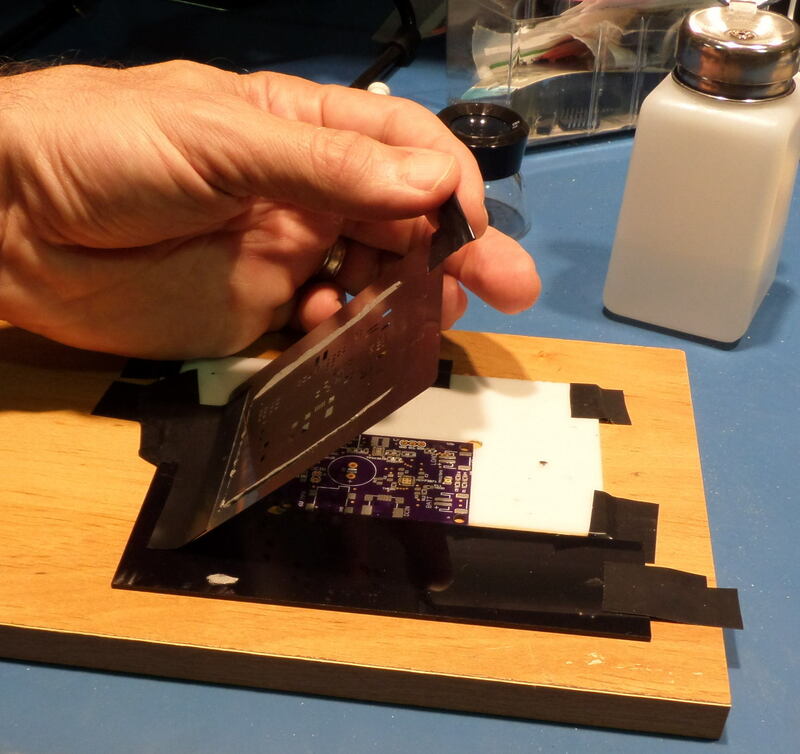 A small squeegee (small piece of plastic credit card) is used to paste over the site(s) for a particular board, then parts are placed and hot air or reflow oven soldering is used. A quick side note about frames. In many commercial environments the stencil is mounted in a surrounding frame that in turn fits into a jig allowing for rapid handling of boards while maintaining precise registration. I was confused Monday: OSH Stencils is only beta testing frame support with two sizes (relative to these boards those sizes are “wow”, and “my lawn is smaller than that”). Contact them for details if you’re interested. I should also point out that I didn’t spend a lot of time routing these boards. For example, I’ve already had second thoughts about the sense line routes for the two shunt resistor boards that have ‘kelvin connections’ to special middle pads under the resistor ends. Also, as I mentioned Monday, I didn’t spend a lot of time checking things like length to width ratios for some stencil apertures. So the very narrow pad for the 1206 shunt board is technically smaller than the minimum supported size listed for the paste being used (Kester EP256), and the result may be that I can’t actually get paste into this spot properly. The footprint is blown up in the image below. The middle of each set of three pads is .28 millimeters wide. The resistor that sits on these pads is about an eighth of an inch long (yes, king size in relation to how these things are trending). OK, but how much do those stencils cost? The minimum is $10, but the incremental cost beyond this is less than a dollar a square inch. The two stencils above came to around $22. First class postage with tracking adds $2.75 to an order. My order was completed on a Thursday and I had the stencils in hand the following Monday. With minimal (.75in) borders, everything you see in the first picture above added less than a dollar to each stencil cost. 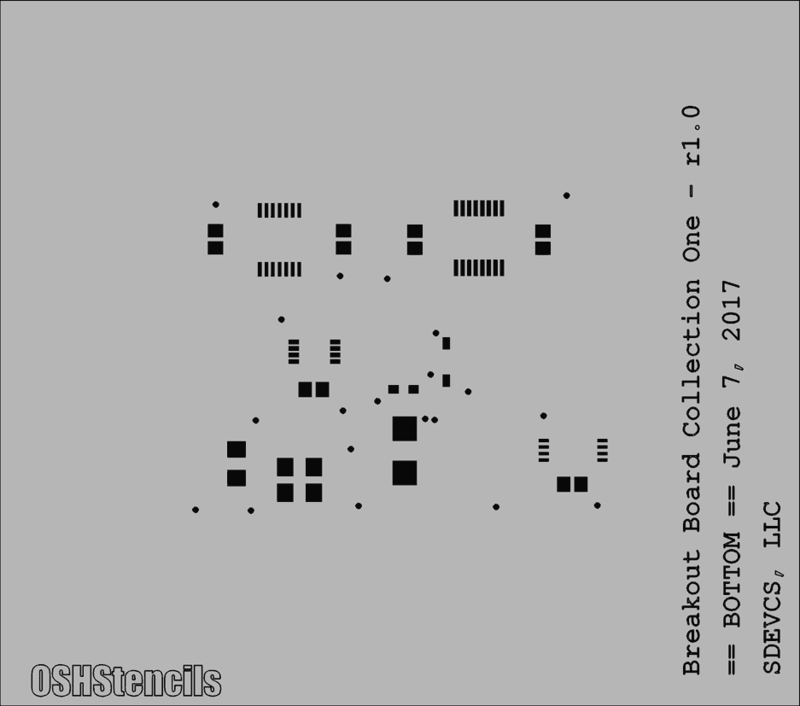 Note that in most cases you’ll only have a stencil for SMDs on one side. 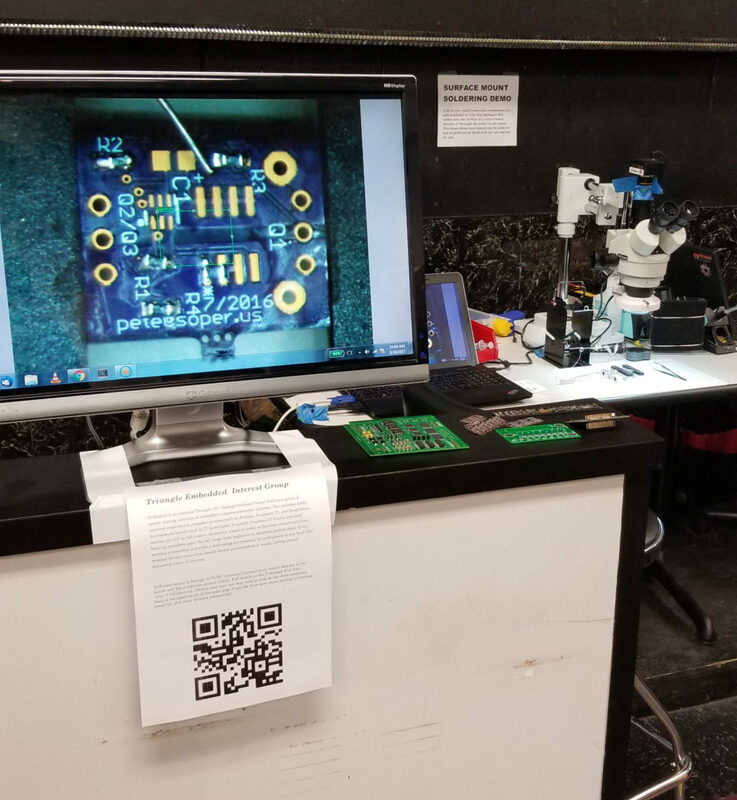 The first batch of PCBs came back from OSH Park and are shown in the picture at the top of this posting. The tabs sticking out are cut off and squared off with sand paper before the boards are used. 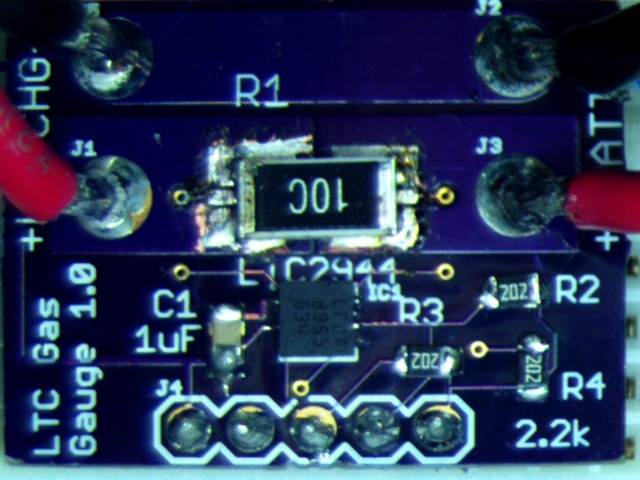 Finally, it’s important to note that some circuits will not cooperate with solderless breadboards and any arrangement of surface mount parts involving long connection paths. Apart from huge amounts of stray inductive and capacitive reactance in the circuit paths, the current carrying limits of breadboards are very real, as is the ability of a simple breakout board to shed heat compared to a PCB having copper pours and other design features to properly handle it. The result was superb: no gray splodges or any other stains. 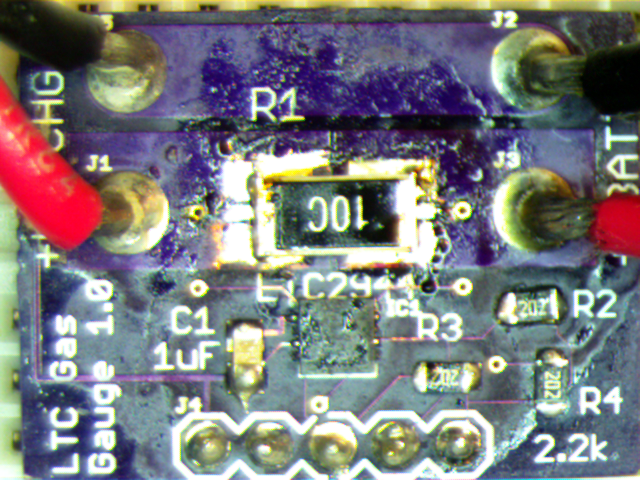 Notice the very tired traces missing solder mask in places. This is what comes of too vigorous scrubbing. The flux remover looks unchanged and I’m expecting that in the tightly sealed jar it has a lot of use left. I was expecting the remover to have evil stuff in it and was surprised to find it’s ethanol, isopropyl alcolhol, and ethyl acetate. The latter is found in small quantities in wine (and many homebrew beers). But despite the familiar chemicals I use lots of ventilation for this kind of task. Thanks to Shane Trent for letting me “try out his jug”. 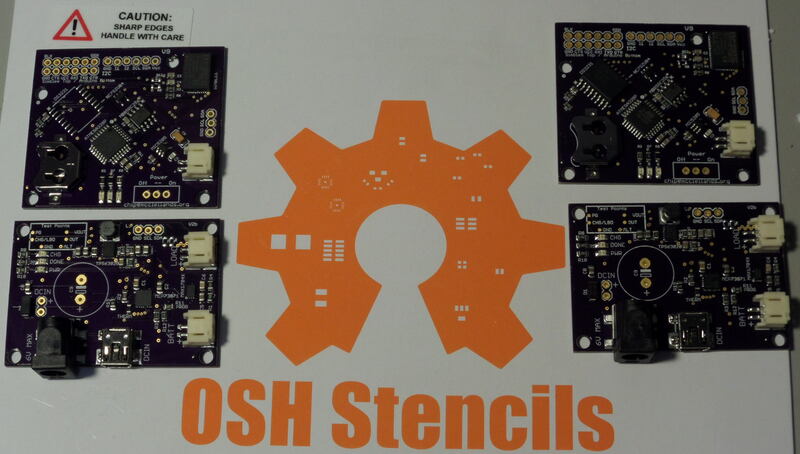 Better pictures of yet another batch of Osh Park PCBs reflowed with solder paste applied using Osh Stencils metal stencils. Paul MacDougal will talk about arranging communication between these two popular single board computers, and Alex Davis will have a Raspbery Pi with Retropie and MAME to show. This will be followed by the usual show and tell and chat session. Bring your projects, ideas and questions. We’ll be meeting in EBI room 1007, next door to the one for previous months (and the same as the one TAR is meeting in). This room will be stable through April.